Viewing the black-and-white air photos in 3D through a stereoscope gives a fantastic feel for the landscape and how it has changed. You can make out terraces of rice fields climbing hillside hollows and village eucalyptus woodlots. Most of the sample of 28 sites (randomly selected and spatially stratified to include sites in the wide-open grasslands of the west as well as the more densely settled valleys of the centre) show crop fields expanding, villages growing, and trees increasing. From a rural development perspective, these trends are consistent with what one would expect from expanding populations of small-scale farmers in an open grassland region. They demonstrate incremental change – the extension of an existing farming system to new lands to accommodate demographic pressure. Only a few sites – outliers – show the imprint of state-sponsored modern agricultural or forestry projects, such as the pine plantations of the Haute Matsiatra or the tractor-based cash crop farms of Mandoto (the wide open spaces of the Middle-West, as Jean-Pierre Raison showed, have long been the graveyard of grandiose agricultural development projects – dreams that have been rekindled in the ‘land grabs’ of recent years). Few roads show in the photo samples – they tend to show just thickening of ox-cart paths. This is a constraint keeping the bulk of rural farmers with one foot firmly in subsistence production. Most of all, there is little evidence of any agrarian change, or of fundamental transformations in the farming system. It is more of the same, rather than involution or modernization – a colonization of open lands, transforming them to productive, hand- and ox-crafted peasant farmlands and cultural landscapes, with occasional exceptions of institutional landscapes of pines or cash crops. Field studies[5-7] confirm what the air photos see – the main trend is simply expansion and some intensification of a smallholder farm system, with some innovation in techniques (e.g. in rice planting) or in crops (e.g. new cultivars, expansion of pines, acacias, eucalypts and other exotic trees). Several of the changes to land cover classes have implications for conservation that I explore through a political ecological perspective in a chapter in a book just published a few weeks ago (Land Change Science, Political Ecology, and Sustainability, edited by Christian Brannstrom and Jackie Vadjunec). For one, the loss of 23% of highland grasslands receives zero attention despite Madagascar being host to major biodiversity conservation efforts. The explanation is simple: the grasslands have long been seen as degraded, secondary, ‘pseudo-steppes’ not worthy of conservation. But recent work re-values these landscapes, so perhaps conservationists should reconsider. Second, farm tree coverage increased five fold, evidence that the Malagasy are tree planters as much as deforesters. Third, loss of 37% of riparian areas and 60% of wetlands (mostly converted to irrigated rice) is a clarion call to conservationists, but the importance of rice to food security and culture make this a particularly difficult topic, requiring a cautious approach and respect for community needs, rights, and capabilities. 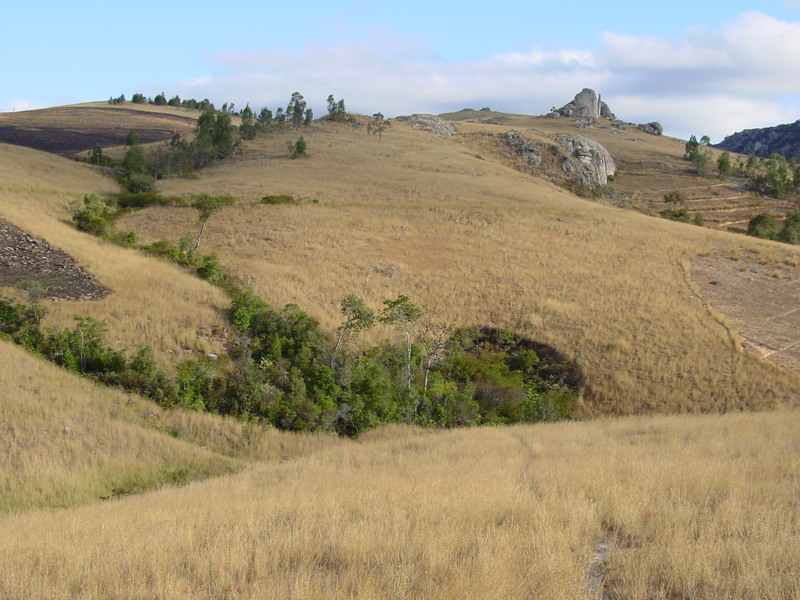 An upland pasture with humid vegetation along a first-order stream valley, including signs of farm expansion – pine woodlots and fallow cassava fields. 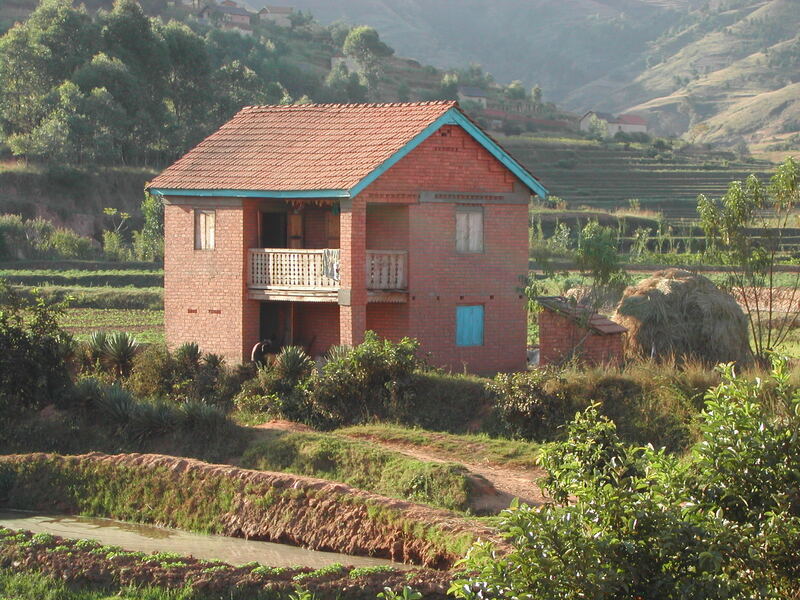 South of Antsirabe. It is a pleasure to finally bring this study to a close. I started it over a decade ago with funding from the Province of Québec’s FCAR research funding agency, but it long simmered on the backburner due to over-grand ambitions, technical challenges, and diverse distractions. Thanks again to all who helped. Farmers labouring in concert with water power to construct a new rice field in an upland marsh surrounded by pine woodlots. Between Antsirabe and Ambositra. 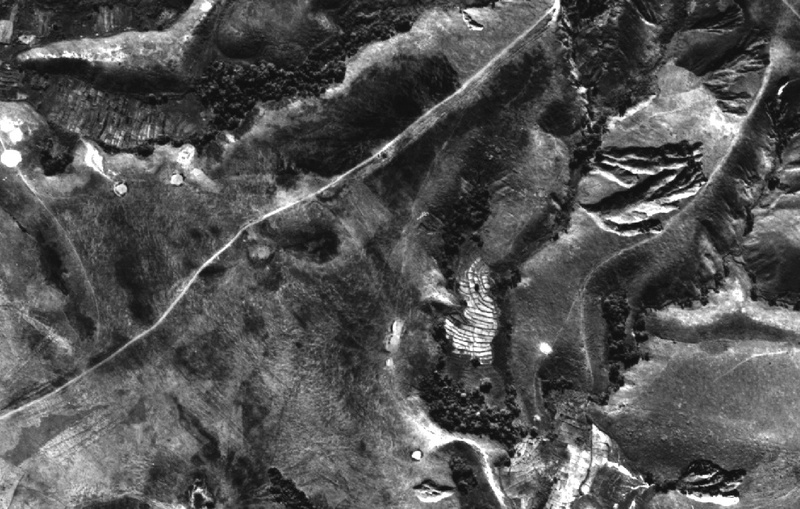 Kull, CA (2012) Air photo evidence of historical land cover change in the highlands: wetlands and grasslands give way to crops and woodlots. Madagascar Conservation and Development 7 (3):144-152. Kull, CA (2013) Politicizing land use change in highland Madagascar: struggles with air photo analyses and conservation agendas. In Land Change Science, Political Ecology and Sustainability, edited by Brannstrom, C & J Vadjunec. London: Routledge. Raison, J-P (1984) Les Hautes Terres de Madagascar et leurs confins occidentaux. Paris: Editions Karthala. 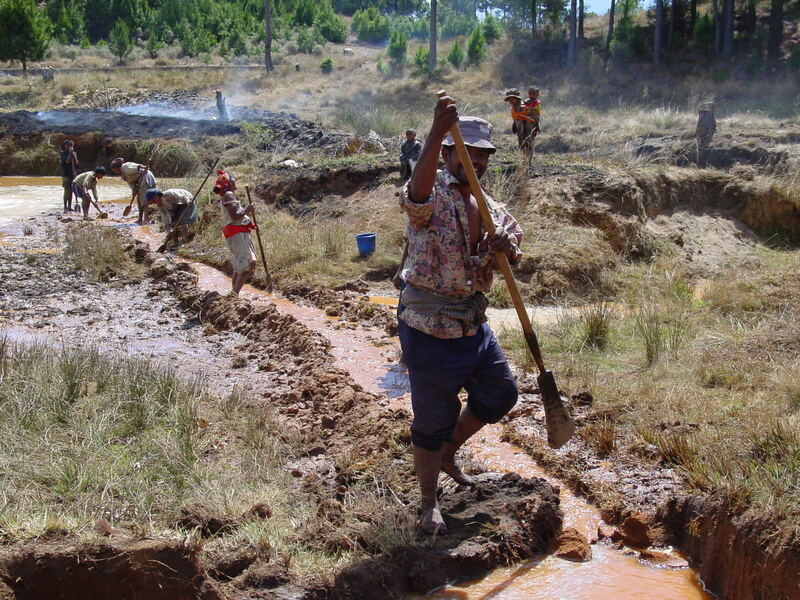 Kull, CA (2008) Saving land with a spade: human landscape transformations in the Madagascar highlands. In Greening the Great Red Island, edited by Kaufmann, JC. Pretoria: AISA, 113-35. 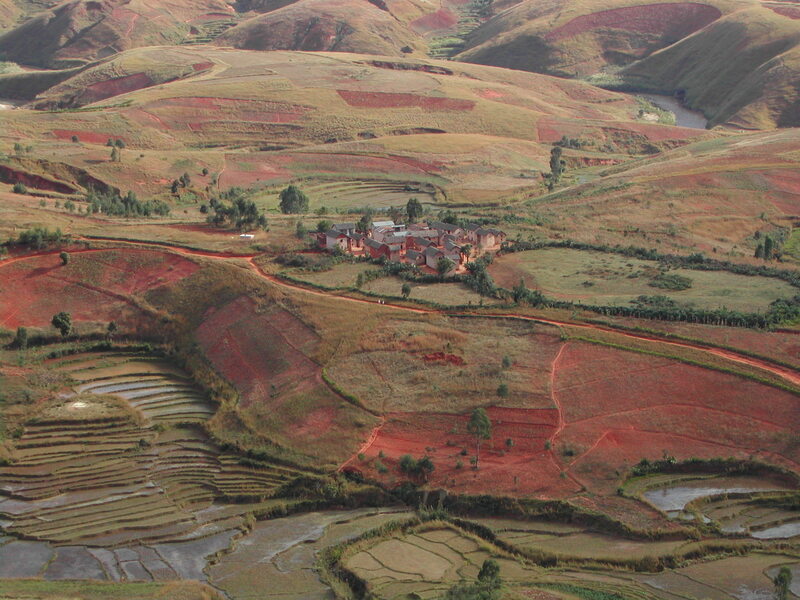 Kull, CA (1998) Leimavo revisited: agrarian land-use change in the highlands of Madagascar. Professional Geographer 50 (2):163-76. Blanc-Pamard, C & H Rakoto Ramiarantsoa (2000) Le Terroir et son Double: Tsarahonenana 1966-1992, Madagascar, Paris: IRD Editions. Rakoto Ramiarantsoa, H (1995) Chair de la Terre, Oeil de l’Eau… Paysanneries et recompositions de campagnes en Imerina (Madagascar), À travers champs. Paris: Éditions de l’Orstom. This entry was posted on Tuesday, September 10th, 2013 at 7:51 pm and is filed under Development, Madagascar, Political ecology, Research, Smallholder farming. You can follow any responses to this entry through the RSS 2.0 feed. You can leave a response, or trackback from your own site. you do not reference your article in Environment & History in this piece. Is there a reason for it? Good point, Verena… I guess because it is older!